Clothbound, 11 x 11 in. / 256 pgs / 250 color. Edited by Virginia Ruano. Introduction by Orlando Hernandez. Text by kevin Power. Contribution by Cuauhtémoc Medina. This is the first monograph of the renowned Cuban artist Josª Bedia, whose art is as fresh as wet graffiti and as ancient as cave paintings. The Cuban-born artist resolves the distance of millennia in spare line drawings rooted at once in an appreciation for comic art and an abiding belief in the shared characteristics of indigenous faiths. A priest of Palo Monte, a rural religion closely tied to nature, Bedia has studied with Lakota Indians, the Yoruba of West Africa, and adherents of the pan-Caribbean Santer'a religion. From a personal cosmography born of his immersion in diverse cultures, Bedia's drawings are populated by godlike animistic figures with extenuated limbs that reach out over great distances, perhaps alluding to the artist's desire to bring diverse cultures into synchronic unison. Sentences written in elegant script often suggest didactic messages, as in one circular canvas in which a rabbit-eared figure growing from a mountain holds in its fist a wide-winged bird straining to reach the horizon. No puedo retenerte ms is the inscribed legend--I can no longer hold you. It is a sentiment familiar to anyone who has tried in vain to restrain something that must be freed--a child, a lover, a secret--or conversely felt trapped by loving constraints. 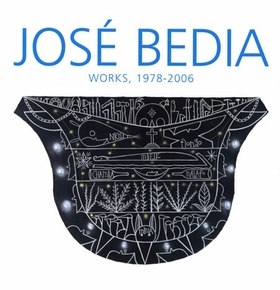 Though accessible on the surface, Bedia's art inevitably withholds layers that remain ambiguous. Why are such intimate sentiments set against astrological renderings of the night sky? Why are offerings left at certain drawings and installations? Even for the uninitiated, Bedia is a great teacher, using his tremendous graphic skill to engage viewers in a personal spiritual voyage. FORMAT: Clothbound, 11 x 11 in. / 256 pgs / 250 color.